(Reuters) - U.S. 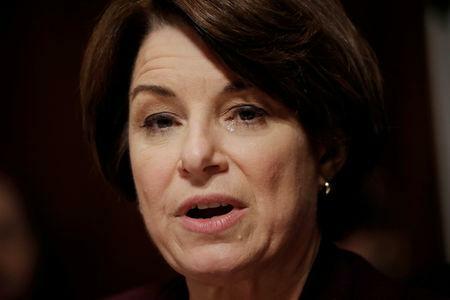 Senator Amy Klobuchar will enter the 2020 presidential race on Sunday, becoming the first moderate in an increasingly crowded field of Democrats vying to challenge Republican President Donald Trump. "I'm asking you to join us on this campaign. It's a homegrown one. I don't have a political machine. I don't come from money. But what I do have is this. I have grit. I have family. I have friends," Klobuchar said in prepared remarks for a rally Sunday afternoon in Minnesota. "I will look you in the eye. I will tell you what I think. I will focus on getting things done. That’s what I've done my whole life. And no matter what, I'll lead from the heart."